Network World 30th Anniversary: Jump in the Cool Tools time machine to see what things Keith was obsessed with over the past three decades. This week marks Network World’s 30th anniversary – a pretty significant milestone considering all the changes in the tech and publishing industries. While I haven’t been around for all 30 years of Network World (I started at the magazine in late 1999), my healthy obsession with gadgets, devices and other technology (including video games) has been around for most of my life. 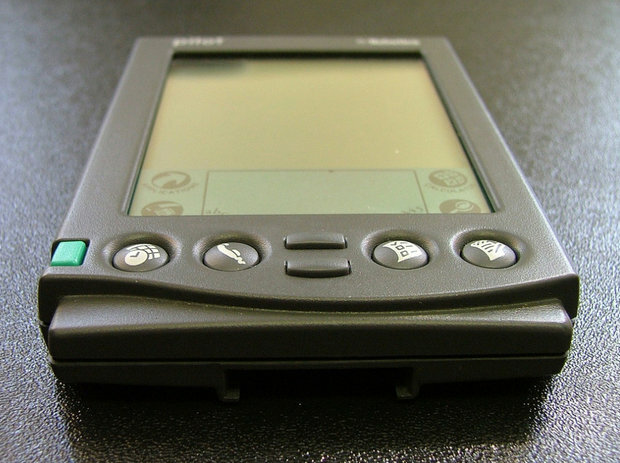 Here’s a year-by-year roundup of some of the significant devices that came into my life – they might not be the same year that the device came out (I was young and cash-poor at the time), so don’t write in complaining. Who knew that this guy would become a world-famous gadget reviewer? 1986: The year Network World was introduced, I was completing my freshman year at Syracuse University. One of the biggest events for me that year was when a fellow dorm resident (he also became my roommate the next year) went to an off-campus arcade and purchased a “Battlezone” video game cabinet and smuggled it up to the fourth floor lounge. This caused a little bit of a stir, but the residence hall director said as long as he wasn’t charging people to play the game (it was set for “free play”), they were fine with it. A lot of people in that dorm got really good at Battlezone that year. 1987: Sophomore year at SU, the same year that the basketball team made it to the national championship game against Indiana and lost on a last-second shot by Keith Smart (ugh – I have the same first name; at least in 2003 the team got its title). The biggest “device” I was using was an electric typewriter that my father had let me bring to school, I was able to make some bucks on the side typing up papers for fellow students. Those two years of typing classes in high school finally paid off! 1988: Junior year at SU, and the year where I had my newspaper internship at the Syracuse Herald Journal (an afternoon paper). The paper did have computers for reporters to type their stories, but I also remember this new-fangled device called a “fax machine” that enabled people to communicate with the newsroom reporters and editors. I also got rid of the electric typewriter in favor of a re-built IBM PC clone (my dad was always building his own systems). I was supposed to be typing papers on it (I did for the most part), but I also spent a LOT of time playing PC games (including Might & Magic and Pool of Radiance). 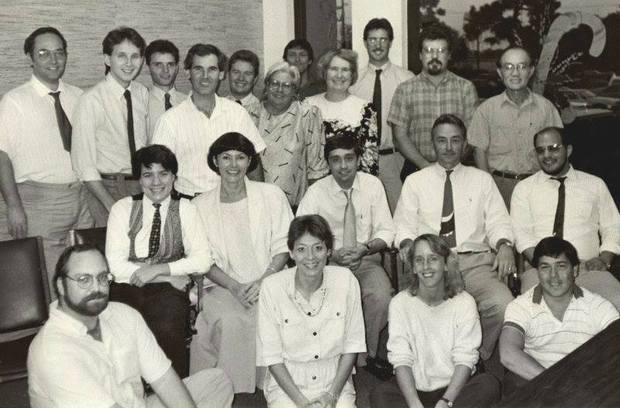 The crew at the Charlotte Sun-Herald (Port Charlotte, Fla.) in 1990. Portable computers galore! Your friendly neighborhood reporter (and future infographics editor) is fifth from the left in the back row. 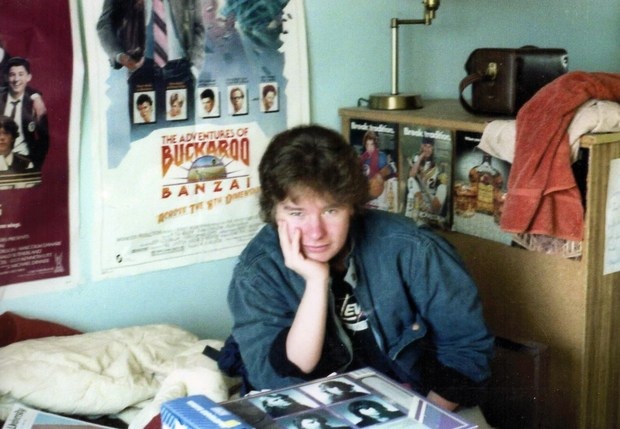 1989: Senior year at SU! After graduating in May, I spent a glorious summer in Philadelphia where I worked for a grand total of one day at a company that produced Yellow Pages ads for the telephone book (wow, there’s a lot of old technology in that sentence). After that experience, I drove down to Englewood, Fla., where my father and stepmother were relocating (they weren’t retiring, they just didn’t like winters anymore). Got my first job at the Charlotte Sun Herald (Port Charlotte, Fla.), where I got to use my first “portable” computer – a Radio Shack TRS-80 Model 100 that you had to connect to a telephone handset modem in order to transfer the stories into the main computer system. 1990: This was the year that I really started getting into online services. 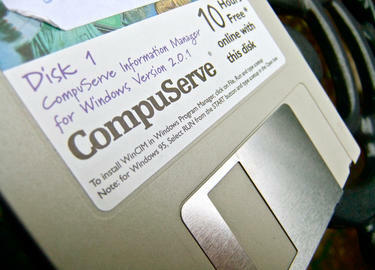 During the year my father and I had accounts with Compuserve, Prodigy, and GEnie. I spent a LOT of time playing games and chatting with other people via these burgeoning online services. Had my first flirtation with the Macintosh (I became the newspaper’s graphics designer and started drawing infographics for articles). But I was still a PC guy at heart (at the time). 1991: Left the Florida newspaper to take a job in Newburgh, N.Y, as graphics designer for a small newspaper that no longer exists. First major experience using QuarkXpress to do newspaper page layout, as well as my first AOL account (I was the original owner of the kshaw@aol.com - no numbers needed here folks!). 1992: After the newspaper closed down, I had to move back in with my parents, who had relocated from Florida back to Glens Falls, N.Y. (they wanted to go back to school to get advanced degrees, I guess they weren’t as sick of winters as I’d thought). Spent most of my unemployment catching up on “The Young & the Restless” before getting a job at a TV listings company that competed with TV Guide. My Mac experience got me in with the customer service area of the company – I got to help newspaper editors across the country with technical support on delivery of their TV listings via Macintosh. Wooooo! 1993: My QuarkXpress dominance and connections with the Newburgh, N.Y., newspaper publisher got me a new job as Design Editor at the Sentinel & Enterprise in Fitchburg, Mass. I helped redesign the newspaper, bringing it into the modern age of computer publishing. Got insanely addicted to the X-Wing computer game and “Sam and Max Hit the Road” from Lucasarts. I recently re-played Sam & Max (you can buy a digital version of the game via GOG.com), it still holds up! But this time, I got through the game a lot faster thanks to modern Internet cheat guides. 1994: This was the year Earthlink was founded, allowing me to finally get rid of my dial-up AOL account (having that email address was starting to get annoying, as everyone thought I was someone else – named Ken, Karen or Kyle). My love affair with dial-up modems (2400 modems all the way through 56K!) 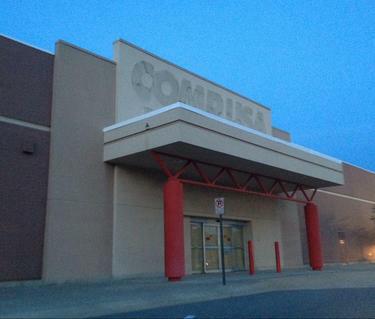 begins, as well as regular trips to CompUSA and Computer City, in Framingham, Mass., to buy new hardware and software. Trust me, this becomes important later. 1995: I do regular visits to my father and stepmother, who have now moved back to Florida in order to continue their education (again, finally sick of winters). My father gets his first cell phone, a monstrosity of a device that needed you to connect to a shoulder bag for its transmitter and/or battery. I don’t remember much about the device, but I do remember the large bills he ran up (he was good at that). Also, this was the year I met my future wife, a reporter at the newspaper in Fitchburg that I was still working at. 1996: My second experience with unemployment! Left the job (involuntarily) in Fitchburg, landed a brief stint at the Lawrence, Mass., Eagle-Tribune, where I had to wake up at 4 a.m. in order to get to the newspaper at 5 a.m. to start culling the newswires for stories. My biggest device during 1996 was a solid alarm clock. Officially began dating the woman who would become my wife. Quit my job at the Lawrence paper by announcing to the managing editor that I was taking a job at Computerworld in Framingham, at which point he said, “Why would you want to sell computers?” (he thought I was leaving for CompUSA – see, I told you that reference would be important). 1997: Began my IDG career, joining the copy desk at Computerworld, where they liked me for my technology knowledge and copy editing skills, likely in that order. By this point, my online forays included using the Netscape browser and editing stories of the “browser wars” between Netscape and Internet Explorer. I bought a Nintendo 64, which I still own, and can beat you at Mario Kart if you ever want to play. 1998: At work, we started hearing about this “newfangled search engine” called “Google”. Spent a lot of time doing searches on this new site instead of AltaVista or Yahoo (sorry, guys). Also, I got married, but there wasn’t a lot of technology at the wedding. 1999: Switched over from Computerworld to Network World – although, to be fair, it wasn’t until the end of the year (December) that I started the new gig. At the time, we were all writing lots and lots of stories about Y2K and the impending doom, which never happened (thanks, COBOL programmers!). 2000: My time on the Cool Tools column begins! The column was originally started by another Network World editor, but I took it over after he left and made it the monstrosity and legend that it is today (at least in my own mind). Got to experience the Palm Pilot and its series of PDAs – I believe we were able to purchase some Palm III devices for the staff this year. 2001: Obviously, September 11 was the big event of the year (some would say decade as well); for me it also had a significant technology component. I was set to go down to the Networld + Interop (now just called Interop) event in Atlanta, my flight was on 9/11, but I never made it onto the plane. I heard updates on the radio on the way into Logan Airport, so by the time I got to the gate I was looking for updates on a cell phone I was testing at the time. It used WAP technology to connect to email and alerts (remember the whole “WAP is Crap” slogans? ), as trying to connect via cell phones was tough that day. 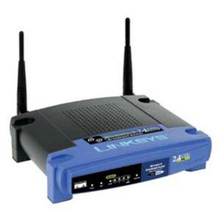 2002: My favorite device this year was the Linksys WRT54G, a home network wireless router that used the 802.11g protocol, and one that greatly speeded up Internet access for many homes. I had switched over from dial-up broadband/DSL to cable Internet access when we bought our new home in 2001. 2003: This was the year I really got into my iPod – it had been out for a few years, but the rise in digital music (and my Napster obsession) meant that I had a lot of digital music. Lucky for me, this was the year Apple released its third-generation iPod and also started selling songs on iTunes for 99 cents. 2004: This was the year Facebook was founded, but I didn’t really experience the joys of cat photos, political rants and inspirational sayings until a few years later – after they opened it up to regular people instead of just college students. For me, the year was spent trying to listen to my iPod in the car – luckily I was using the NewerTech RoadTrip car adapter, which let you listen to the music via tuning your radio to an unused frequency. Thank goodness AUX ports started showing up in cars. 2005: This was the year my first daughter was born, so like all new parents we invested in a home video camera. It was either a Panasonic or Canon camcorder that cost a lot of money and recorded information on little cassette tapes. I still have those tapes sitting in a drawer somewhere, thank goodness that most of that was converted to digital cameras and smartphones a few years later when we had our second child. 2006: My favorite device for this year was the Pleo robot, which debuted at DEMO 2006 early in the year. It was also one of my favorite videos that I did for the burgeoning Network World video section. 2008: Smartphones were in full swing by then, but the big news for me (and lots of other people) was the debut of the Roku Internet TV system with Netflix service. At the time there wasn’t a lot of content, but that quickly changed (some would argue that Netflix still doesn’t have a lot of current content, other than their original series). TV watching would never be the same after this. 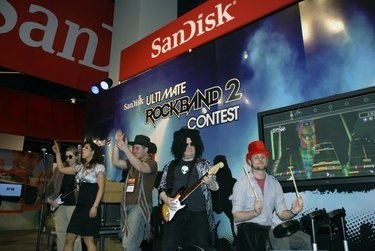 In 2009, I could really "Slash" a fake guitar. 2009: With my third child now on the way, I had less time to enjoy my gadgets, but I still found time that year to get totally obsessed with Guitar Hero and Rock Band (see above). Sadly, most of that gear (guitar, drums, even a keyboard) sits down in my basement collecting dust, which is why I didn’t really get excited for the recent new versions from both of those companies. No way, guys, I’m spending too much of my money on Disney Infinity figures now. 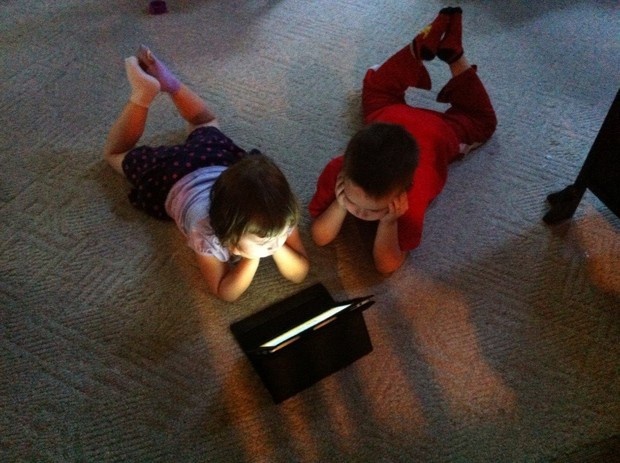 My original iPad and daughter, who still thinks the device is hers. 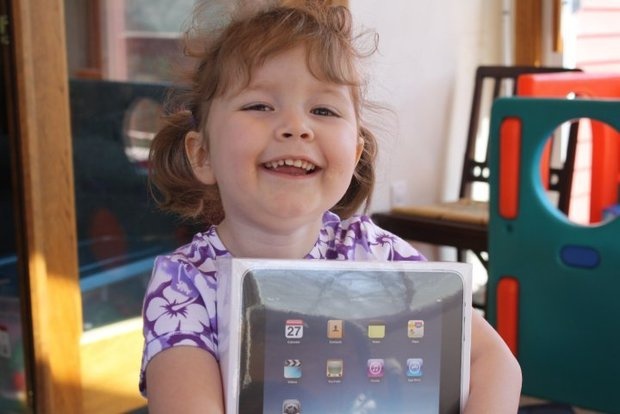 2010: The year belonged to Apple again, as it debuted the iPad. I still have the original one somewhere – I can’t really remember because one of the kids took it and didn’t put it back where it belongs, like they do with EVERYTHING. 2011: This was the year I officially made the switch from Windows computers to Macintosh – my first MacBook Pro is still going strong (well, it’s a bit slower, but still preferred over Windows 8). 2012: Back to the iPhone well for this year – this was the year I got the iPhone 5, making me current with other iPhone users who at this point really liked upgrading their phones this year. I had a brief flirtation with the Samsung Galaxy S3, but that was a quick fling. Just another typical day in the Shaw house, with kids streaming videos from a centralized NAS box. 2014: During our testing of the holiday gift guide this year, our testers got OBSESSED with the Lenovo Horizon 2 Tabletop PC, which gave you a multi-touch display for games, apps and other activities, with a computer built in underneath. 2015: While I still love my iPhone 6S (which came out in 2015), my MacBook Pro (work version, not the home one that’s a bit old), I have to say my favorite device is my PlayStation 4, which Santa brought us in 2014. The system is now my go-to device for most of my gaming (and my son’s gaming), that it’s central to our life experience these days. 2016: I have a feeling that perhaps we’ll finally see some good VR; Sony just announced its $399 device, and the Oculus Rift ($599) and HTC Vive ($799) are expected later this year as well. Whether this is another fad (Google Glass, anyone?) or the start of another big shift in gadgets remains to be seen. That’s just a small window into my life of gadgets, work experiences with technology and video game fun (there were a lot more obsessions I could have brought up). I hope that this sparked some memories, and perhaps we’ll do this again in another 30 years, via our Internet-embedded-into-our-heads live video chat that will be all the rage in 2046.